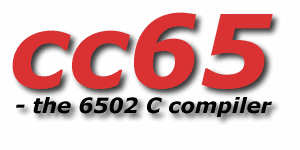 cc65 is a complete cross development package for 65(C)02 systems, including a powerful macro assembler, a C compiler, linker, librarian and several other tools. It is based on a C compiler that was originally adapted for the Atari 8bit computers by John R. Dunning. The original C compiler is a Small C descendant but has several extensions, and some of the limits of the original Small C compiler are gone. The original copyright allows free redistribution including sources, even if it would not qualify as Open Source Software according to the Open Source Definition. Supported targets are: Commodore C64, GEOS operating system for the Commodore C64, Commodore C128, Commodore C16, C116 and Plus/4, Commodore P500, Commodore 600/700 family of computers, Apple ][, Atari 8bit machines, Oric Atmos, Nintendo Entertainment System (NES), Supervision Game Console, Atari Lynx Console.